Amy shared a great tutorial on how to turn Sculpey into a fun clay necklace using basic crafting tools. I know my daughter would love to make some of these to wear to school on her first day. 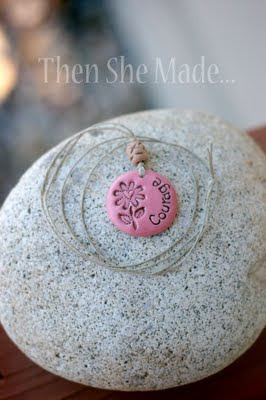 And to make them even more special, she made these beautiful pink courage clay pendants in honor of her friend and mother-in-law, both who were recently diagnosed with breast cancer. You can see her tutorial on how to make clay pendants over at Then She Made. ooh, I might make one of these saying "luck" on it as a back to school gift for my girls! Thx for sharing! Thank you so much for featuring my necklace - that was quite a nice surprise to pull up your page and see my photo - smiles!